more. “We don’t like it, we don’t want it, but this scenario might happen,” said Fathi Baja, the rebels’ head of international affairs. We find ourselves in the unusual situation—unprecedented in the lifetime of nearly every American breathing today—of watching from the sidelines as world-historical transformations unfold….The fate of all these uprisings is certainly a matter of U.S. interests—arguably, in the case of Egypt and Yemen, our vital interests. Yet there’s little we can do to direct their paths. The one exception, he says, is Libya. But that may be the exception that proves the rule. How likely is it, after all, that either the United States or its allies will be willing to accept a long, dull stalemate like this? In a sense, it would be even worse than the kind of grinding, inconclusive war we’re fighting in Afghanistan, where we can at least concoct stories about progress and eventual victory. But if Libya settles down into a partition with essentially no fighting at all, no such stories will be possible. We either accept the partition or we don’t. How likely is it that we will? There’s not a lot of precedent to go on here, but it doesn’t seem like the kind of thing the American (or French or British) public would accept for long. Sure, nobody would be dying, so there probably wouldn’t be huge public protests, but we’d still be committing ourselves to an expensive, indefinite military operation with no goal except to protect the partition of a country nobody really cares much about in the first place. So what are the alternatives? 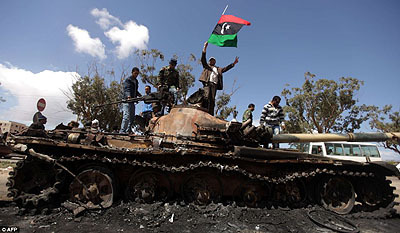 There are two: either a negotiated settlement of some kind or a decision that the war has to end and Qaddafi has to go. That would mean a Kosovo-style air campaign against Tripoli, kept up until Qaddafi finally either surrendered or was killed. This is what makes some kind of negotiated settlement so important. Without it, the most likely end point isn’t partition and stalemate, it’s a broadening of the war. How many stalemates can a single president have on his plate at once, after all?